How many of you are participating in one? I think the earliest book challenge I remember participating in was our local library’s Summer Reading Program. I remember taking home the book log and borrowing as much books as I could carry just so I could fill up all the spaces on that log. And it was about a 100 spaces. I don’t think I filled them all up, but I’m sure I got to 80. And I can’t remember if I ever collected the prizes for reading, but that didn’t matter to me. What mattered is I completed that list. Now, I’m sure the goal of that program wasn’t to read as many books as you possibly can, even though that’s what it seemed to me. I’m sure it was to encourage reading and pertaining logging down a hundred books is definitely encouraging. I remember doing this only for one summer and besides doing book reports for school I never again participated in a reading challenge until I signed up for a GoodReads account in 2012. It allowed me to set the number books I want to read for the year and then it helped me to track it. I was so excited. Book geek, I know. For me, I like watching that bar move as I progress towards my goal. And I like clicking on the link to my challenge and seeing the books I read for that year. There is something satisfying about reaching my goal. Even if I don’t get there, I love that I have a progress report. 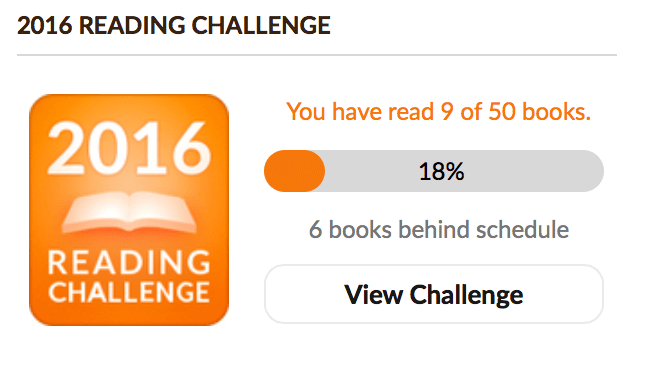 Speaking of which, notice how I am already 6 books behind this year’s challenge? Ugh! Participating in the “how many books you can read this year” type of challenge is always fun, but what I discovered last year was a different type of reading challenge. It spiced things up and listed goals like “A book with 400 pages” or “a book of poems.” Now, these challenges I found very interesting. You not only add to your “how many books” challenge, but while doing so you have the added challenge of finding a book that meets a criteria on the reading challenge list. I love it. Last year it was the PopSugar Challenge (which you can view here) which I didn’t quite complete, but I enjoyed trying. This year it’s a bit different (and you can check that out here). I have to say, I’m not doing too bad. I do wish I had more time to read, though, but it’s all about balance, eh? If you’re part of a reading group, they have different book challenges as well. After being a member of GoodReads for about year, I decided to explore Reading Groups. I stumbled across a couple I liked and found they offer monthly, quarterly, and yearly book challenges as well as a monthly book read for the entire group. I have a lot of things going on, but I did get to try a book sprint. It’s a challenge in which there is a criteria list and I have to read books matching that list in a specific amount of time. For example, in the first quarter of the year (Jan-Mar) I had a list with five criteria i.e. a book with a blue cover and I had to complete that list within those three months. I missed it by one book, but it was fun to do. #10 – A book you started but never finished – because there is a reason I didn’t finish it, right? Sighs. So, to all of you who are in the middle of a book challenge, best of luck to you!